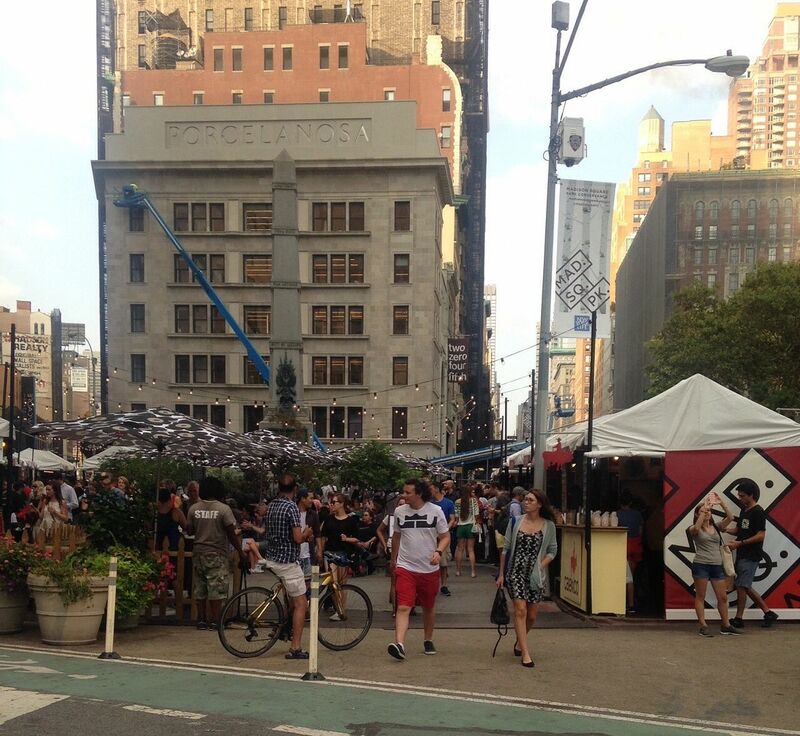 Madison Square Eats offers a tempting mix of street food in extremely close quarters. Madison Square Eats is back in the bustling park with new vendors and lots of buzz but only a stingy smattering of small metal tables. If you can score a table, a rail to lean on or a patch of sidewalk to yourself, the seasonal huddle of food kiosks -- lovechild of UrbanSpace and The Madison Square Park Conservancy -- is a chance to eat on the cheap as traffic buzzes all around you. After sidling through the crowd, I stalk the narrow aisles between food stalls, formulating my strategy. Sushi burrito? Maybe not for me. 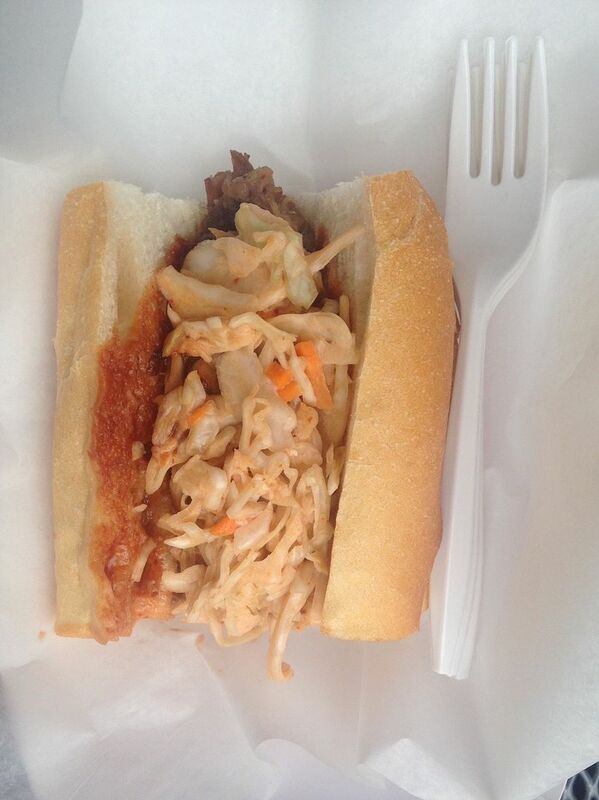 The Dragon Sandwich is tender and spicy even with slightly limp slaw. Mayhem and Stout’s handwritten signs, young women with tattoos slinging sandwiches and their specialization in slow braised meats, tell me it’s a must. I ask for their favorite sandwich and they fork over The Dragon: braised pulled pork with Asian BBQ sauce and spicy slaw. The meat is remarkably tender and the bread, wonderfully crisp. Perhaps the slaw could be crunchier, but it makes a nice contrast anyway. 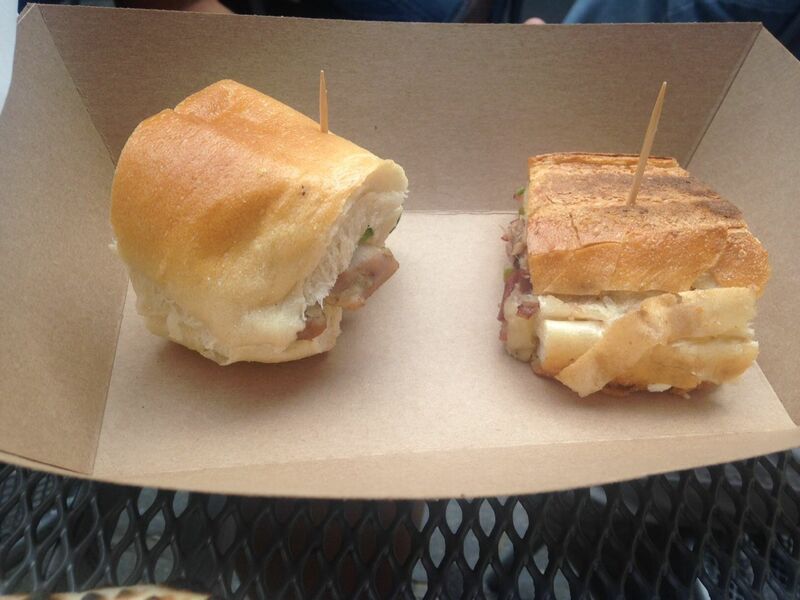 Sandwiches here run about $10, but they aren't skimpy. The excellent Pig Head Cuban makes me want more. Sandwiches from The Cannibal Beer and Butcher are worth lining up for too. The Pigs Head Cuban with Vermont ham, pickles and Gruyère is my favorite. The pressed country bread has the near teeth-shattering crunch I expect from a Cuban and the inside is deliciously soft and melty. The tiny sample I tried made me hunger for the real deal, large and worth the $12. Overhearing several eaters gushing over the pizza from Roberta's, I figure I’ll brave the long line. I can’t resist The White Guy Pizza with ricotta, mozzarella, and garlic oil, the crust nicely charred and appealingly chewy. The $10 personal-size pizza is big enough to split with a friend, if you have one along. Melt’s silky malted chocolate and rum ice cream makes the frozen cookie worth chewing. After that immersion in savory, I need dessert. The adorable $5 ice cream sandwiches from Melt Bakery are perfect. I could easily put away three or four of them in the sultry heat of the evening, but I settle for The Morticia, a chocolate cookie with malted chocolate rum ice cream. 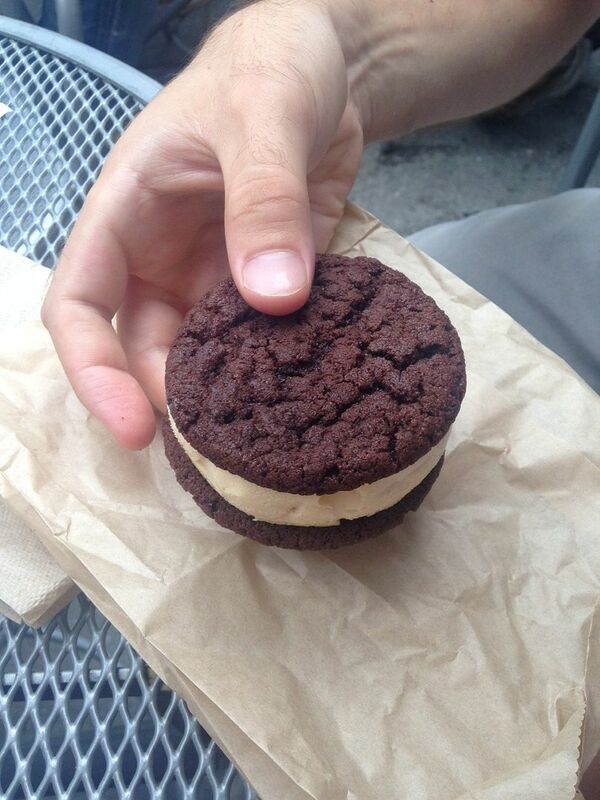 The cookie seems a little stiff perhaps due to freezing, but the ice cream is wonderfully creamy. Order a dozen sandwiches and they'll deliver.